When Anaïs de Froissart calls Parisian private investigator Aimée begging for help, Aimée assumes the woman wants to hire her to do surveillance on her philandering politician husband again. Aimée is too busy right now to indulge her. But Anaïs insists Aimée must come, that she is in trouble and scared. Aimée tracks Anaïs down just in time to see a car bomb explode, injuring Anaïs and killing the woman she was with. Anaïs can’t explain what Aimée just witnessed. The dead woman, Anaïs says, is Sylvie Coudray, her cheating husband’s long-time mistress, but she has no idea who wanted her dead, and Anaïs officially hires Aimée to investigate. As she digs into Sylvie Coudray’s murky past, Aimée finds that the dead woman may not be who Anaïs thought she was. Her Belleville neighborhood, full of North African immigrants, may be hiding clues to Sylvie’s identity. As a prominent Algerian rights activist stages a hunger protest against new immigration laws, Aimée begins to wonder whether Sylvie’s death was an act of terrorism, and who else may be at risk. Cara Black is the author of sixteen books in the New York Times bestselling Aimée Leduc series. She lives in San Francisco with her husband and visits Paris frequently. "While Aimée grounds the novel with her strong, savy personality, in Murder in Belleville the real star of the show is Cara Black's depiction of contemporary Paris with its racial tensions and seedly underworld. The sights, sounds and smells of the city are captured in exquisite detail." "Cara Black and Aimée Leduc are to Paris what Sara Paretsky and V.I. Warshawski are to Chicago . . . She makes Paris come alive as no one has since Georges Simenon." "Intriguing . . . The suspense begins immediately . . . 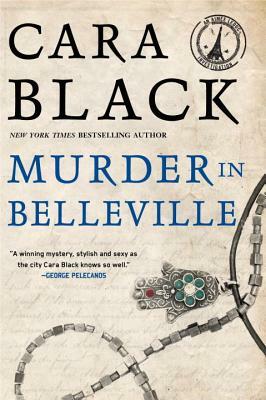 Some of Black's strongest writing is in her descriptions of Belleville's heady atmosphere." "Blurring the edge between mystery and thriller, Black’s second makes April in Paris more spine-tingling but more beautiful than ever."